The shorelines of Humboldt Bay are littered with ghost towns ... rusting remnants of the county's once-rumbling economic engine. Halfway down Samoa Peninsula sits the idling structures comprising the 45-year-old Evergreen Pulp Mill. Since 2008, the factory, once employing over 200 people, has been managed by a skeleton crew charged with maintaining functions at a bare minimum should the unlikely occur -- a restart of the plant's massive five-story boiler. It's been more than a year since the turbines have turned over. For a while, co-owner Bob Simpson's striving efforts to find some $400 million in funding for parent company Freshwater Pulp Co. surmounted obstacle after obstacle. Then they finally ground to a halt last month. In 2005, then-owner Lee and Man Paper Manufacturing of Hong Kong split from Evergreen Pulp. That relationship had been tenuous at best, and little investment had been made to modernize Evergreen. The onshore winds buffet the sprawling mill's miles of boiler and exhaust pipes. The elevator in the boiler tower is down, stuck on floor one. Fourteen flights of stairs usher a visitor to the top. At the ceiling, a small ladder leads to a shoulder-width hatch; then, one of the widest views of Humboldt County -- a 180-degree expanse of east county's hills, the harbor entrance far down to the south, Trinidad Head in the north. Directly below sits an empty asphalt parking lot. On lower-tide days, the bow and superstructure of the U.S.S. Milwaukee -- grounded since the 1917 failed rescue of the U.S. Navy submarine H3 -- is visible between wave sets. Three osprey soar the breeze between the stacks. They've taken roost atop quiet exhaust pipes and have done well on the steady diet of Evergreen's ample pigeon population. You wouldn't want to hang out on the roof for long during a winter storm. It's the tallest building between San Francisco and Portland ... if it housed offices instead of the five-story boiler, it would be classified as a skyscraper. That boiler is an engineering feat pointing to the industrial optimism of the mid-century, hanging independently. The mill's last moniker -- Evergreen -- nodded toward an environmental optimism the plant initially battled. Under Bob Simpson, its forced departure from industrial pollution was grabbed as a solution to post-timber woes. The mill was dragged into the modern era following Humboldt Surfrider's Clean Water Act lawsuit against the mill, then owned by Lousiana-Pacific, and against the Simpson pulp mill in Freshwater. 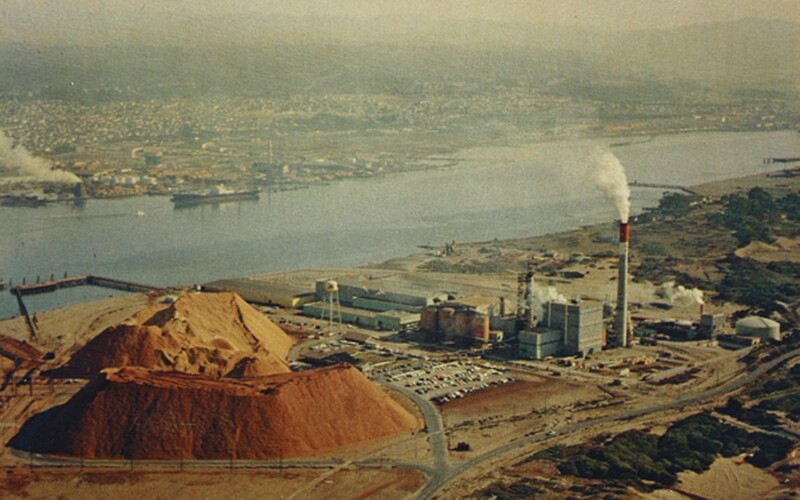 Settled in ’91, the two-year lawsuit closed the door on both mills' ability to dump some 40 million gallons of activated chlorine (the "Kraft" process of converting wood pulp into bleached white paper) and untreated wastewater daily into the ocean. The effluence contained dioxin and excessive levels of other toxins. Surfers were coming out of the water with skin rashes and complaining of nausea. The U.S. Environmental Protection Agency levied the largest penalty in the western United States at the time -- $5.8 million. L-P successfully made the transition to use of hydrogen peroxide in the pulp bleach process, and constructed its wastewater treatment element to eliminate toxic discharge. Concurrently, the mill's ocean outfall pipes were extended well beyond the shoreline. 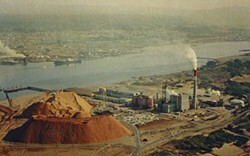 Simpson Paper Company did not modernize, and closed its pulp mill in ’96. Since the departure of Lee and Man, Bob Simpson had been attempting to restart that boiler and refire the North America's only non-chlorine pulp mill, ensuring greener industrial jobs well into the future. In September, Simpson annouced that the mill would be permanently closed and parted out. The ghost town is established and now, while they still stand, only the pigeons and osprey will rule the Samoa stacks.